In 2007, the United Nations General Assembly, recognizing that human activity was causing a highly accelerated rate of species extinctions, and expressing concern that such mass extinctions could have far reaching social, economic, environmental and cultural impacts passed G.A. Resolution 61/203. This resolution reaffirmed a target date, 2010, set at the 2002 World Summit on Sustainable Development, by which time a significant reduction in rate of loss of biodiversity should have been achieved. 2010, as the target date, was named the International Year of Biodiversity. Now that it is 2010, it can easily be seen that this goal has not been achieved. 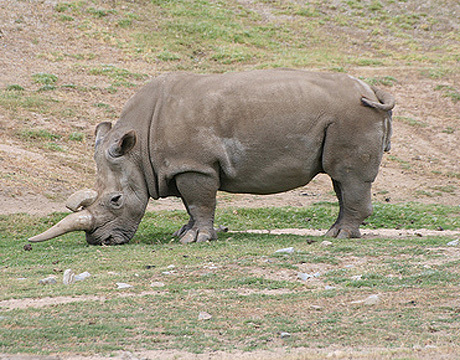 Arguably, species, such as the West African Black Rhinoceros pictured above, are disappearing from the Earth at a faster rate than they were when the resolution was passed. The United Nations Convention on Biological Diversity, in its Global Biodiversity Outlook publication, itself notes that while setting the 2010 goal spurred some 170 countries into creating biodiversity strategies, the goal of reducing the rate of extinctions is far from being met due to economic and political pressures. In fact, the publication acknowledges that continuing species extinctions far above historic rates will continue into the century.